February 5, 2019, 2:18 PM · In an effort to promote the coverage of live violin performance, Violinist.com each week presents links to reviews of notable concerts and recitals around the world. 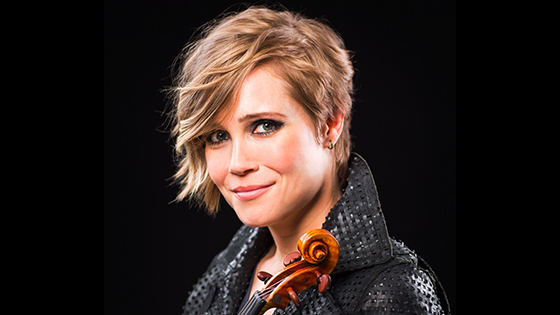 Leila Josefowicz performed John Adams' 1993 Violin Concerto with the Dallas Symphony Orchestra. Texas Classical Review: "Josefowicz poured herself into the athletic demands of her role, while the orchestra continued to give the composer the respect of zealous attention to detail and precision of execution. The result was a memorable experience by any standards, and a justification of Adams’ richly colorful, high-adrenalin brand of minimalism." Julian Rachlin performed the Mendelssohn Violin Concerto with the Boston Symphony. Boston Globe: "Rachlin wore no blinders, readily engaging with Mena and the orchestra and displaying a hearty tone and gorgeous dynamic range that carried above the ensemble. He tore into the cadenza with relish, holding the audience rapt." The Boston Musical Intelligencer: "Julian Rachlin steered Mena and the BSO clear of sentimentality to share higher aims. Embracing optimism and assurance clearly separates this violinist from today’s crowded field of artists swept up with 'I can play it faster.' Rachlin truly is filling a vacuum. He had Boston’s audience standing and cheering. " Karen Gomyo performed Mozart's Violin Concerto No. 5 with the Minnesota Orchestra. TwinCities.com: "Gomyo gave it fresh life with a pure tone, gentle touch and some arresting cadenzas. The first-movement cadenza sounded something like a falling leaf twisting this way and that, while the second movement’s was more akin to the last strains of a lullaby. And the finale had a fine blend of forcefulness and frivolity." Simone Porter performed Bruch's Violin Concerto No. 1 with the Fort Worth Symphony. Theater Jones: "Porter immediately demonstrated total technical command, virtuosic flair, and a beautiful tone across the spectrum, which she continued to display throughout the concerto and its dramatic journey." Dallas Morning News: "No challenge of velocity or intonation could faze her, and her Guadagnini instrument could produce big, bold tones as well as subtle intimations." Vivianne Hagner performed Vieuxtemps Violin Concerto No. 5 in A minor with the Sarasota Orchestra. Herald-Tribune: "Violinist Vivianne Hagner captured the gentility of the Vieuxtemps concerto, both the lyric Adagio and the challenging fingerwork of the outer movements with grace and ease." YourObserver.com: "Hagner is an excellent violinist, playing with a brilliant, focused sound, and she was certainly up to the technical challenges of the concerto. In the lyrical second movement the theme is based on an operatic aria by Grétry, in which she spun a beautiful melodic line." William Hagen performed the Brahms Violin Concerto with the Abilene Philharmonic. Abilene Reporter News: "Guest violinist William Hagen wowed classical purists and casual listeners in the audience with his masterful play and command of Brahms' 'Violin Concerto in D.'"
Nicola Benedetti performed in recital with pianist Alexei Grynyuk, in Santa Fe, New Mexico. Pasatiempo: "She proved capable of bristling staccatos and soaring lyricism, and — not a given for violinists — she put vibrato to truly expressive use. It was an intense interpretation." Nigel Kennedy performed a recital at the Festival Theatre. ArtsHub: "This recital featured an eclectic program. Works by J.S. Bach and George Gershwin book-ended Kennedy’s own composition, 'The Magician of Lublin.' Bach’s divine Concerto for Solo Violin made a beautiful beginning and demonstrated Kennedy’s brilliant touch....Once that bow is raised, the audience is mesmerised. There is an earthy physicality to his playing that belies his immense skill, passion, and versatility." February 5, 2019 at 08:51 PM · +1 to Nigel Kennedy. February 5, 2019 at 09:41 PM · What is Bach's Concerto for Solo Violin? February 6, 2019 at 05:36 PM · Funny, that is exactly my favorite one!